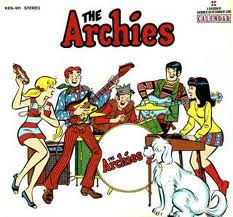 Gen Xtinct: Funky Food Friday: "Sugar, Sugar"
OK, it's not really a food, but to round out our weeklong look at cartoon characters singing, today we're talking about "Sugar, Sugar," the signature, sickly-sweet tune by The Archies. According to Wikipedia, the song was originally offered to the Monkees, who not-so-politely passed. Mike Nesmith apparently put his fist through a wall to illustrate just how vehemently he didn't want to record the song.